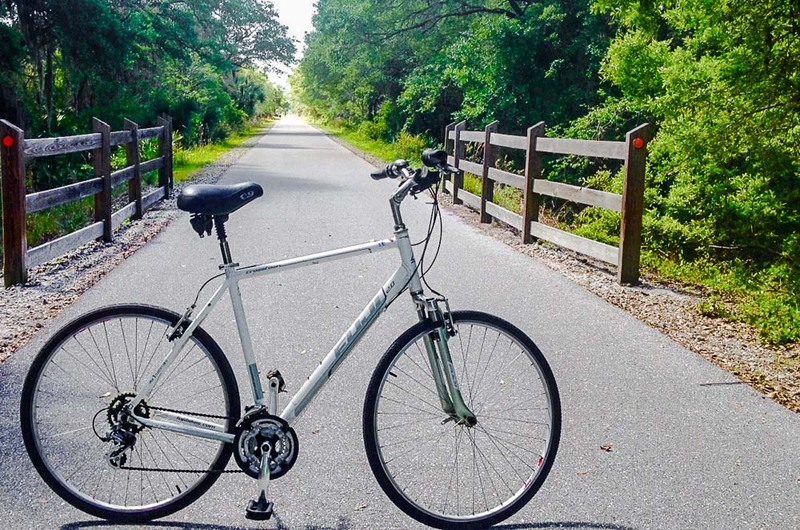 The Legacy Trail is an old railroad-bed that was re-purposed by Sarasota County in 2004. The county joined with The Trust for Public Land to purchase the first 12.5 mile section of the old Seaboard Airline Railway. The tracks have now been removed and the rail bed paved with asphalt. The trail is open to pedestrians, skaters, and bicycles from 6:00 AM to sunset. 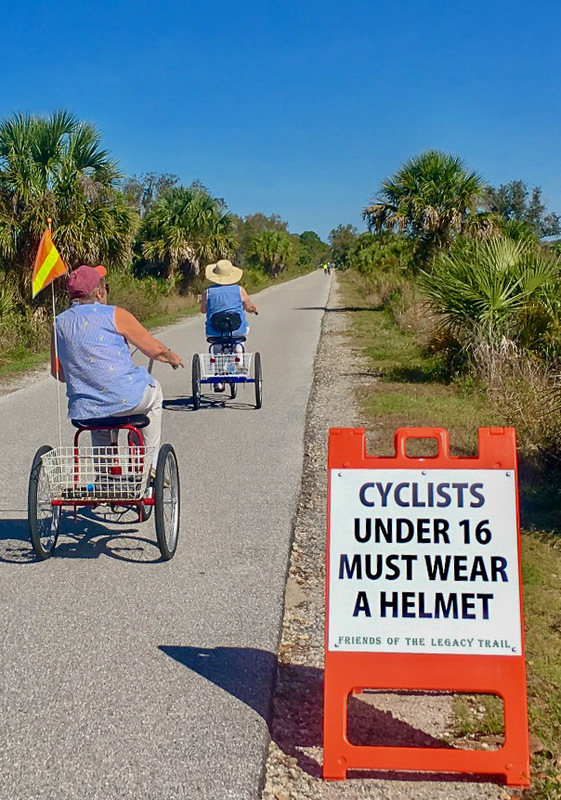 The Legacy Trail is wide enough to allow four bikes to pass abreast, however, users of the trail, either on foot, or wheels, should never travel more than two-abreast in one direction. From 1960 to 1992 the Ringling Brothers, Barnum and Baily circus used this railway to bring the circus animals to stay in Venice for the winter. The Legacy Trail officially begins at the Historic Venice Train Depot and runs north toward Sarasota, and ends just south of Clark road. The trail is not lighted. No travel after sunset is permitted. During the Summer of 2010 two key bridges over local waterways were added to the Legacy Trail. These low bridges are close to the water and allow trail-users to cross Dona Bay, and Robert’s Bay without leaving the safety of the Trail. Both bridges include scenic lookouts where you can stop and take in the view. Be sure to bring your camera as sunrises and sunsets are particularly spectacular viewed from either bridge. The trail officially opens at 6:00 AM and closes at sunset each day. This doesn’t mean that you are locked in. There aren’t any gates, in fact. But the trail is not lighted, and you could easily be injured attempting to ride in the dark. Perhaps the crown jewel in the construction of the Legacy Trail is the gorgeous pedestrian bridge across US 41 in Venice. The bridge was completed in 2012 and is just north of the Train Station on the Legacy Trail. Pedestrians, cyclists, and skaters can cross US Hi-way 41 Bypass without getting into road-traffic. Although improvements to facilities continue, the Venice Train Depot, Patriot’s Park, and Laurel Park are the only convenient stops along The Legacy Trail where restrooms and drinking-water is readily available. There are a number of covered rest-stops with park-benches, and one port-o-let in the northern section, but there are no other amenities along the trail’s length. Plan to bring water and any food that you may need. While the actual usage of the trail greatly exceeds the projected usage, it is still possible during some mid-day hours in the Summer to ride the length of the trail without seeing another soul. Legacy Park is one of our favorite delivery-locations. It’s located on the north side of the Venice Avenue Bridge, just behind the Historic Venice Train Depot. Use the roads beside, and “under” the Venice Avenue bridge to get to the park. From the park you can access to both the Legacy Trail, and the Venice trail. While the park is not actually directly on the Legacy Trail, a defacto access next to the Hampton Inn has been established by trail users, and we can show you where it is. The park contains a number of memorial monuments to our military, as you would expect, but is also contains an artifact that all Americans would be moved by. We won’t say what it is, but will let the mystery stand. You’ll know it when you see it. 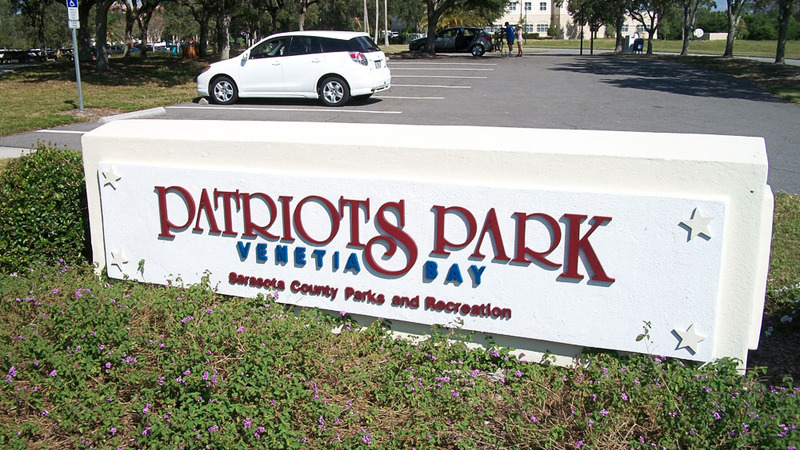 Patriot’s Park has restrooms, and drinking fountains, and lots of parking space. Coming from Sarasota on I-75 take Highway 681 toward Venice. Bear right when you come to US 41 and the park is on your right. You are in the right place if you see the Hampton Inn Venice sign. This delivery location has become popular thanks to the proximity of I-75 Interstate exit number 195. The small parking lot is at the North-West corner of the intersection where the Legacy Trail crosses Laurel Road. Look for a small pavilion and a park bench under it. Bike rental customers driving South on I-75 Interstate take Exit 195 and bear right and head East. Driving North on I-75 Interstate take exit 195 and turn left. Travel approximately 1 and a half miles and look to your right immediately after crossing the Legacy Trail. The small parking lot is on your right hand side. 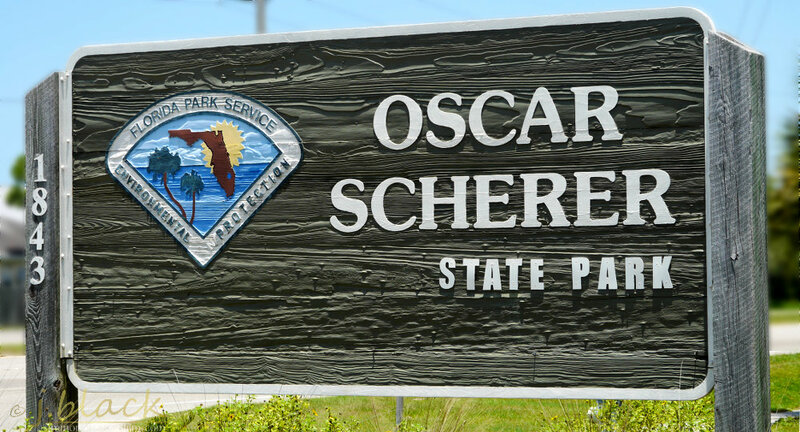 This is a Florida State park well known for its rustic walking-trails, and primitive camping. You can access the park directly from the Legacy Trail, and also from US Highway 41. Customers who want to rent a bike and ride the Legacy Trail are directed to drive all the way into the back of the park in order to be closest to trail access. 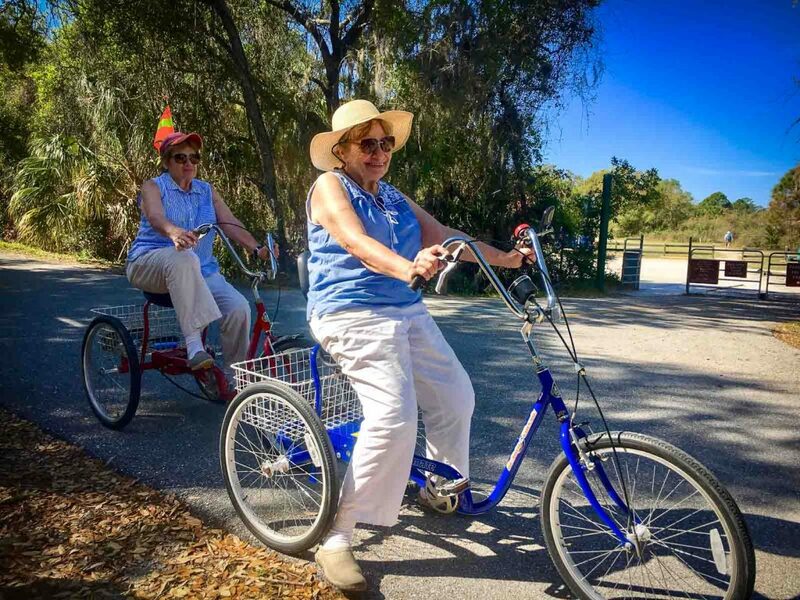 This delivery location is particularly suited to customers who visit our area coming from Sarasota and who want to ride the Legacy Trail for a day. This is also an exchange point for our customers who want rent a bike in Venice, but take it back to Sarasota for longer rental periods. At the end of the rental period we can meet you back at the park. We have car racks available for rent, but they are not always a universal fit for every vehicle.